Hono O Na Pali: This reserve contains two adjacent mountain valley systems that terminate in sea cliffs. The landscape is etched by several continuous and intermittent streams. Sea cliffs, coastal, stream, wet forest, wet shrubland, montane bogs, and grassland communities are represented. The reserve protects rare plants and is home to many species of Hawaiian forest birds. It is also home to unique Hawaiian stream animals including rare freshwater fish (oopu), freshwater shirmp (opae) and aquatic insects, and is nesting habitat for the Hawaiian dark-rumped petrel and Newell’s shearwater. Kuia: Located on the western side of Kaua‘i, this reserve is characterized by gradual to moderate slopes cut by intermittent streams. 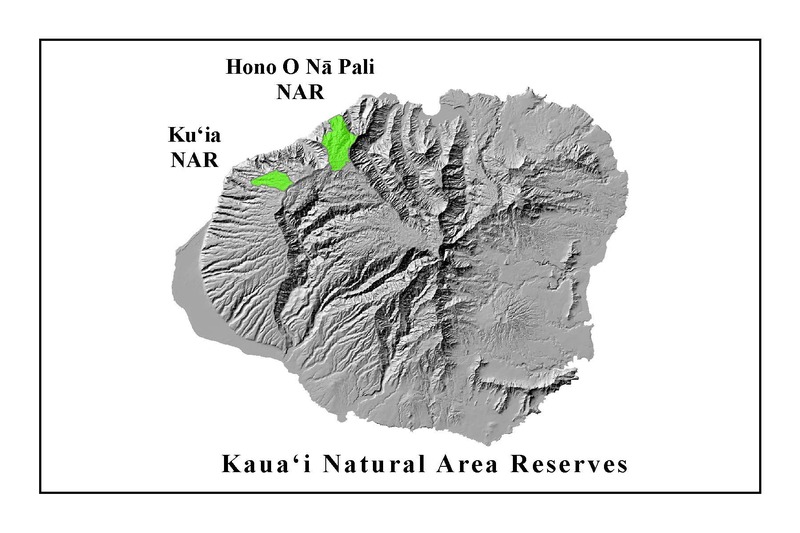 There are two rare ecosystems – a koa-‘ohi‘a mixed montane mesic forest and a Kaua‘i diverse lowland mesic forest. Kuia also contains lowland dry shrublands and montane wet forests.